With the eruption of another holy war on actKM, this time on the need to focus on networks rather than content, I can't help but feel that people are missing the point. which identifies three related cycles of activity that drive towards solution of a problem. 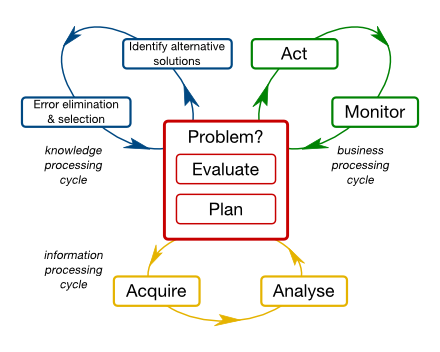 Information processing relates to the gathering of needed information to either develop solutions to the problem or act to put a solution in place; knowledge processing relates to the process of developing solutions and picking the best one; and business processing relates to the execution of actions identified as necessary and determining their effectiveness. In this context, information is necessary but not sufficient to solve the problem. Whether it is best obtained through systematic use of paper documents or electronic content, or by the leverage of human networks, is completely contextual. There is no empirical way to determine which option is "always" better than the other and there are legitimate cases for both. So can we all calm down and take a deep breath before condemning any KM projects that are heavily related to the managing of content?